Babel Rising was a shocking title that offended a great many. There was another camp of people who enjoyed playing it. Bulkypix has released a free sequel in the form of Babel Rising Cataclysm. I understand many of our readers being cynical and asking how free is this app. You can play every single level without paying any money. There are ads that constantly appear. So you have to stomach that. Babel Rising Cataclysm lets players take on the role of God. Yes God! We have to smite down humanity as they try to build the Tower of Babel. We take on the role of a wrathful God who does not show any mercy. Humans in Babel Rising Cataclysm are stubborn, and have extremely high numbers. They keep coming, over and over again. It can get tiring to have to kill off all these people at such a high volume. 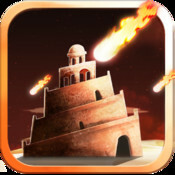 Graphically Babel Rising Cataclysm earns its rating. In fact I can see this game easily earning the 12+ Apple rating instead. I grew tired of all the violence and death in Babel Rising Cataclysm. The humans should get a clue and obey God instead of constantly being disobedient. But then look around our world and see how many people are constantly disobeying God. Many of them are doing it openly, and others are celebrating their descent into deviant destruction. The music in Babel Rising Cataclysm is okay. The encouragement to murder off all of the people is one aspect of Babel Rising Cataclysm that I am not very thrilled about. The natural disasters we send out as well as the death can be un-nerving. I had problems with the controls in Babel Rising Cataclysm. Things were not always working. And since the people march forward like an army of ants - it could mean failing one of the forty levels. Yes there are only forty levels in Babel Rising Cataclysm. So it is a little light on the replay value. If you want to learn all about other Bulkypix games, then Babel Rising Cataclysm is perfect. Why? Because of all the advertisements that are streaming at us while we are using this app. I understand companies are looking for different ways to reach audiences. I would have gladly paid ninety-nine cents for the ads to go away. But I was not provided that choice. I feel the pace of Babel Rising Cataclysm is a little too fast for many families. I would like that slowed down. Please click on one of these link(s) to purchase this game and support us. Family Friendly Gaming is given a 4-5% commission on all orders.